For massing of colors in beds or borders, the Petunia is still one of the most popular flowers. In window boxes or overhanding a terrace wall their riot of color in enchanting. 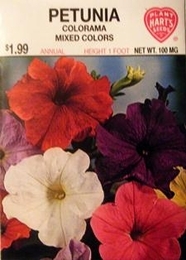 Petunias like the sun and often bloom within 2 months from seed and continue until frost. Almost no other annual flower succeeds so easily or so well as Petunias when planted in a sunny position. For denser plants and more flowers pinch or shear when 6 inches tall and keep faded flowers picked. Thinning - when plants are 2-4 inches tall thin to 8-12 inches apart.